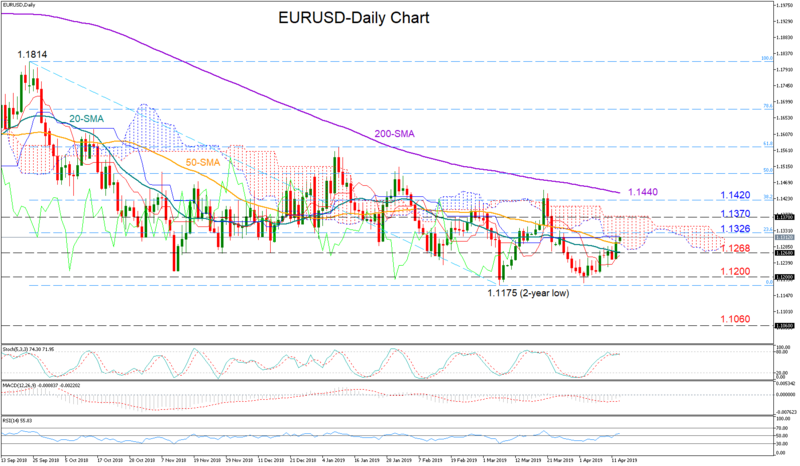 EURUSD is pushing hard to enter the 1.13 neighbourhood and pierce its 50-day simple moving average (SMA) after a bullish week. Technically, the risk seems to be skewed to the upside as the RSI is holding a positive slope above its 50 neutral mark and the MACD continues to distance itself above its red signal line. However, with the stochastics fluctuating near overbought territory, any gains could come limited. Should the pair overcome the 23.6% Fibonacci of 1.1326 of the downleg from 1.1814 to 1.1175, the focus will shift straight up to the upper surface of the Ichimoku cloud, near 1.1370. Clearing the cloud, the bulls would aim for the 200-day SMA currently at 1.1440 but the 38.2% Fibonacci of 1.1420 could prove a hurdle as in previous sessions. In medium-term picture, EURUSD is in a downtrend since early January and only a decisive close above the 200-day SMA could increase hopes for a bull market.